So, this comic was drawn 11 years ago and now look how bad this sort of thing has gotten. The guy in the White House lies pretty much ever time he opens his mouth now and pretty much everyone pretty much just shrugs it off. But hey! 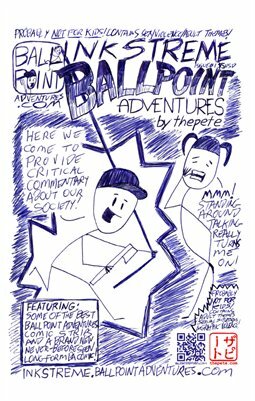 You can still download the first digital BALLPOINT ADVENTURES mini-comic right now! For FREE! Just go here to get the 12-panel PDF: http://finetip.ballpointadventures.com! Feel free to let me know what you think of it by commenting below or hit me up on Twitter (@thepete)! I'd be lying if I said I wouldn't do this if I knew how to. One thing I know YOU know how to do is download the first digital BALLPOINT ADVENTURES mini-comic right now! For FREE! Just go here to get the 12-panel PDF: http://finetip.ballpointadventures.com! Feel free to let me know what you think of it by commenting below or hit me up on Twitter (@thepete)! From 2006: Billy wants YOU to NOT trust our leaders! Well, this is an ironically timed classic BALLPOINT ADVENTURES comic, considering what is happening this week in Washington DC... now, just a reminder, Billy only fake kills people. Don't consider anything you see in this comic as an endorsement of violence. Seriously though, fake killing is more fun than real killing, for a lot of reasons, including the part where you don't have to go to prison or the electric chair for it. Hey, go download the first digital BALLPOINT ADVENTURES mini-comic right now! For FREE! Just go here to get the 12-panel PDF: http://finetip.ballpointadventures.com! Feel free to let me know what you think of it by commenting below or hit me up on Twitter (@thepete)! This is why I've been listening to Democracy Now for over a decade now. That isn't where I get ALL my news--no source should be trusted completely--but it is the most reality-based that I've been able to find. Billy and Barbie wonder if Trump knows who the biggest fool is! Hey, I think I've answered the age old question "who is the bigger fool?" The bigger fool is the one who can't recognize the fool in the mirror. From 2006: Billy can't just kill indiscriminately! Hey, sometimes our metaphorical escapes need to practiced literally. Hey, have you downloaded the first digital BALLPOINT ADVENTURES mini-comic yet? well, do it now for FREE! Just go here to get the 12-panel PDF: finetip.ballpointadventures.com! Feel free to let me know what you think of it by commenting below or hit me up on Twitter (@thepete)! Is it REALLY a Happy New Year?